Defiance MO real estate has an average home age of 23 years. Homes for sale in Defiance MO range in price from $100,000 to $1,000,000. The median home price in 2014 was approximately $375,000. Many of the homes in the area are located on acreage. Defiance is known for the gorgeous rolling hillsides and for being the gateway to many of Missouri’s wineries. There are 17 Wineries within 15 miles of Defiance offering amazing views, music, food and award winning wines. Defiance properties are served by the Francis Howell School district. See Great Schools for up to date ranking on every school in the area. If you are looking for a home for sale in Defiance MO or you would be interested in buying a home in Defiance, please contact St. Charles real estate expert, Sharon Colona and St. Louis Realty for a professional and simple buying or selling process. Call (636) 397-7653 or email at scolona@stlouisrealty.net. This extraordinary 4 BD, 6BA home sits on 92+/- acres. Some of the many luxurious features in the home include, hand-honed timbers, distressed hardwood floors, stone floors and countertops, custom cabinets, stone fireplaces, high-tech sound and TV and exquisite fixtures. Experience the amazing outdoors in the comfort of the screened porch, the cozy sunroom or thru the many beautiful large windows. This home is perfect for entertaining with two magnificent great rooms. Enjoy the grounds of this estate with park like amenities, a pavilion, softball/baseball/soccer fields, sand volleyball, basketball courts, fire pit, hot tub, and paved walking trails. Plus a lake with private dock that is perfect for cruising on a pontoon, fishing or just taking a swim. This estate was built with excellence and is perfect for a weekend get a way or every day living. Every detail has been thought of including a 400 amp back up generator. Your buyers won't want to leave! This gorgeous home is located minutes from Chesterfield Valley. Serenity is provided at this peaceful Home Site in the Development of, The Crossings at Lauderdale Estates. The Exterior of this home has a Big Cedar Lodge Timber Look and provides an entertainment area with a Beautiful Masonry Fireplace safely nestled in the woods. The spacious garage has plenty of room to park multiple cars while enjoying the additional room for your work shop. As you enter the home you will feel the warmth provided by this homes open floor plan and luxurious features. The home has 2 master suites on the main level, 4 full and 2 half bathrooms, an elegant kitchen with a hidden pantry, and a hearth room with a fire place that leads you to a covered porch. While in the lower level you will pass through the family room on your way to either of the two bedroom suites or the Bistro which boasts stone arches, wine racks and a walk around wet bar with a suede textured granite top. Incredible opportunity if you x2019;re looking for privacy and a Luxury estate. This stunning property has over 5900 sqft of living space, on 30 acres that is complete w/ a 2 acre lake, stable and pasture and features gorgeous views that can only be understood by seeing them in person. You can also purchase an additional 9 acres, stables along w/ a beautiful guest house as well. The pictures just can't capture the true beauty & the home is incredible! This property itself not only offers privacy, you x2019;ll also enjoy amazing hunting & fishing w/ your own stocked lake. Inside the home you x2019;ll find beautiful hardwood floors through-out, cathedral ceilings, gourmet kitchen with hearth room, private sitting room overloothe property and an enormous family room in the lower level. Every bedroom is its own master suite & boasts a luxurious bathroom w/ Jacuzzi tub, separate shower, massive walk-in closets & breathtaking views from every window. This home is one of a kind and the property is spectacular! Amazing Brick/Stone 1.5 Story Custom Built in Elegant August Estates situated on 3.35 wooded acres on quiet street. Built in 2017 with Gracious Entry & Iron Clad Front Door opens to Welcoming Separate Dining Room and Arched Doorways. Hand-Scraped Wood Floors and Beautiful Crown Molding plus Soaring Cathedral Ceilings in Great Room offers window Wall Overlooking Treed Backyard Acreage. Main Floor Master with Trey Ceiling and Bay Window, Luxury Master Bath with Dual Bowl Vanity, Custom Cabinets, Separate Tub and Shower and Enclosed Lavatory steps from Spacious Master Closet. Gourmet Kitchen with Breakfast Room and Adjacent Hearth Room with Stone Fireplace. Kitchen offers Butlers Pantry, Center Island, Gas Range & Hood, Double Wall Ovens and Stainless Frige. 3 BRs Up with Loft. Main Floor Laundry & Family Entry with Osized 3 Car Side Entry Garage. Lower Level offers Billiard Room, Full Bar, plus Home Office & Rec Room. In-Ground Salt Water Pool, Fenced Yard. An Oasis in Wine Country! Incredible Executive Style Home On 3 Acres In Defiance! Stunning brick & stone exterior & side entry 3 car garage will impress! Grand 2sty entry foyer welcomes you and flows into large dining room & cozy den! Large great room has a see thru fireplace that goes into the hearth room with built in bookcases! Hearth room is open to the fabulous kitchen with custom 42 in cabinets, enormous center island, gas cooktop with custom range hood plus built in double oven, granite counters and cheery & bright breakfast room with door to outside deck! Main floor master bedroom has bay window & luxury bath with walkin shower & whirlpool tub! Other features of main level is 10 ft ceilings, crown molding in all rooms, beautiful wood flooring and 8 ft high interior & exterior doorways plus 2 staircases to the upper level! Upstairs there is a large family room and 3 very large bedrooms all with private baths! Private 3 acre lot backing to woods with firepit & patio! A must see home!! New 4 bedroom, 4.5 bath Split Bedroom Ranch Inventory Home by JS Clement Construction now under construction at White Heron Estates. Picturesque 3+ acre home site. Exceptional quality w/impressive high end features & finishes. Brick & Stone front elevation, LP SmartSide siding, quality Pella windows. Mahogany front entry door. 10' ceilings in the main living area. Extensive crown moldings, 3-1/4 wood window casings, 5-1/4 base moldings. Solid Acacia hardwoods. Professional appliances including 36 gas range, 2nd built-in oven, drawer microwave & refrigerator. Quality Kemper cabinetry w/soft close drawers & doors, under cabinet lighting & solid surface counter tops. Hearth rm exits to a covered composite deck/outdoor rm. 1st floor master bdrm & luxurious bath w/custom tile & stone finishes. Finished deep pour walkout LL w/rec room, 4th bedroom, 4th full bath and rough-in for wet bar. Oversize 3 side entry car garage. Great location just minutes from parks, shopping & Wine Country. Simply Amazing! This huge 3 bed/3.5 bath brick front custom-built ranch rests upon a sprawling 3 acre gently rolling lot backing to woods. The open floorplan greets you w hardwood flooring in the entry & a soaring cathedral ceiling stretching rising above the huge great room where you'll find a built-in bookshelves, wetbar & an atrium walk-out to the expansive patio & fenced-in yard. The center hall plan features columns & archways to both the den & dining room + hardwood floors & crown molding in both as well. The bright & inviting eat-in kitchen boasts ample 42 custom cabinetry, decorative tile backsplash, large center island, butler pantry, walk-in pantry, breakfast bar & adjacent breakfast room w sunny bay windows, deep coffered ceiling & walk-out to the patio. Oversized master suite includes coffered ceiling, adjacent sitting room, his & hers walk-in closets & luxurious private bath. Expansive finished LL with giant family & rec rooms + full bath. Big 3-car side entry garage too! Custom brick & stone ranch w/ spectacular views reminiscent of Chandler Hill Winery. Passive solar energy design saves on energy cost. Luxury master suite w/ dual vanity, elevated jet tub, bidet, & private deck access. Gourmet kitchen w/ granite transformation counters, large pantry, custom cabinets, & breakfast bar. Breakfast room w/ bay window. Finished walkout lower level w/ dramatic brick fireplace, recreation room, & custom 16 x 9 wet bar w/ kegerator. Vaulted great room w/ stone fireplace & wall of windows. Grand entry foyer with two story stone wall. Tongue & groove pine ceiling. Divided bedroom floor plan. Large walk in closets. Ceiling fans. Professional landscaping. Full length deck & aggregate patio. Swimming pool w/ deck surround. Oversized three car garage. Circle driveway. Large parking pad. Maintenance free building materials. Heatilator fireplaces w/ hot air fans. Central vacuum system. Additional 10 acres available for sale with barn, stocked lake, and dock. Stunning 4 Bedroom, 2 full/2 half Bath, 2 Story home located on a cul-de-sac, 3+ acre lot & with rights to the subdivisions private 160 acre lake for fishing, boating, sandy beach area for picnics, swimming & more. Beautiful front exterior with pond & covered front Porch warmly invites you in to the 2 story Entry Foyer. Great room with Bay windows & marble surround gas fireplace. Eat in Kitchen shows custom cabinets, granite counters, 8' breakfast bar, tile backsplash, double sink, walk in pantry, all appliances as stated & a Breakfast room with an atrium walkout to a composite Deck. Master Suite displays Bay windows, walk in closet, bamboo flooring & fabulous Bath with whirlpool tub. Secondary Bedrooms with bamboo floors & spacious closets. Lower level offers a Rec room, Family area, half Bath with potential for a full Bath & a walkout to a covered Patio. 2 car oversize Garage with workbenches & service door walkout. Fabulous back exterior with tree line views. Lovely Ranch On Over 3 Acres With Finished Walkout Lower Level On Gorgeous Wooded Lot! The entry foyer with wood flooring opens to vaulted great room with brick fireplace and flows into formal dining room great for entertaining! The wonderful eat in kitchen has wood flooring, stainless appliances, tile backsplash plus a nice size pantry! Large master bedroom has luxury bath with whirlpool tub! Two other nice size bedrooms & full bath on main level! The finished walkout lower level features a family room, rec room, 3rd bath and 4th bedroom! Out the walkout is a wonderful screened in patio area measuring 29 x 14 and the 50 x 14 deck is a perfect place for tranquility & watching the wildlife in your own back yard!! The car buff in the family will love the 4 car side entry garage with 8 ft insulated garage doors! Only minutes from the Katy Trail & wine country!! 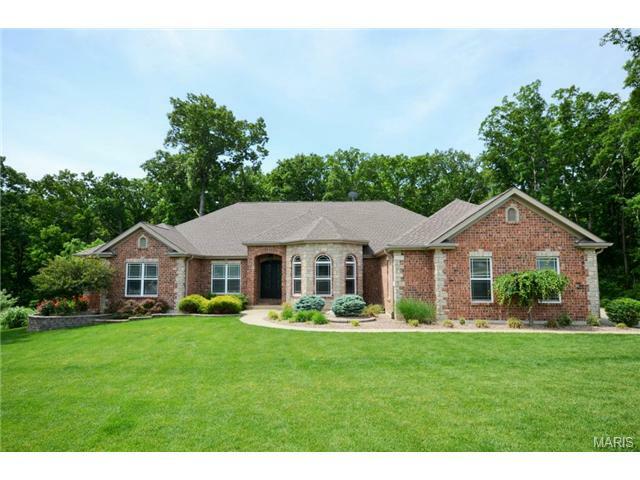 Come see this Gorgeous move in ready 3.5 acre estate in Defiance Missouri. This 1,632 sq. ft. home w/walkout basement has it all. New Custom Cabinets with five foot island and granite in the kitchen. 2 Living rooms both with wood floors 1 w/wood burning fireplace, New Custom Ceilings, can lighting, Solid Wood interior doors. 2 new bathrooms with a rough in for a bath in the basement. New 12' x 30' deck with stairs to the ground. 2 New exterior doors, 2 new six foot sliding doors, New Roof, New gutters and down spouts, New soffit and fascia, New siding, New front porch, New hot water heater, added insulation in the attic, and a fully updated septic system. The private lot has no HOA and is in a prime location. All New paint and New flooring throughout. Freshly blown in attic insulation. This home is a must see... A rated Francis Howell School District. Close to Busch's Wildlife, located in Defiance Wine Country. Come see this home today. Enjoy quiet country living at its finest surrounded by picturesque 11 acres backing to trees. Includes a 3BR, 2BTH manufactured home & a large working horse barn in Unincorporated St. Chares County. An equestrians dream, this property offers 2 pastures w/slip board fencing & a 55x100' horse barn featuring a tack room, observation room, 1/2 BTH & feed room (all w/baseboard heating), 3 12'x12' stalls, a wash stall w/heat light, hot & cold water & fiberglass walls along w/an indoor riding area. The updated manufactured home offers an open floor plan w/a spacious living room and newer kitchen. The master suite offers a walk-in closet & private full bath. This home also provides 2 additional bedrooms, a full hall bath and laundry room. A great place to relax or build your dream home. So much potential. Schedule your showing today! Find your peace and quiet with this gorgeous 3bd Defiance property. This fantastic home sits on a just over an acre of land and features low maintenance brick/vinyl siding, a level lot, spacious two car garage (w/separate shop), large front deck, back porch and shed with large patio sitting area (with fire pit). The main floor of this lovely split level home features a nice living room and a spacious family room that features tons of windows bringing in plenty of natural light and a gorgeous wood burning fireplace with floor to ceiling stone surround. Kitchen features custom cabinets, appliances and a breakfast room with walk out to the back patio. Upper level features 3 spacious bedrooms and full bath. The lower level includes a large space for entertaining that includes a wood burning stove for those cold winter nights. You will also find a laundry/utility room and a half bath on the lower floor. Home is close to plenty of hiking and fishing at Busch Wildlife Preserve.